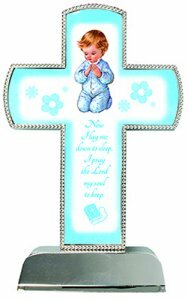 DIRECT FROM LOURDES - Blue Metal Cross 6" - Praying Boy. Blue Metal Cross 6" - Praying Boy. Metal blu woode standing cross 6" - praying boy.